We - Manisha Machinery Private Limited are the industry's leading enterprise offering a wide range of Honing, Lapping and super finishing machine. Our complete range of cutting edge machinery products provides precision solutions regarding honing and lapping applications. Our range includes Manual Honing Machine, Auto-stroking Timer Sizing Honing Machine, Auto Gauging Honing Machine, Manual O.D. Lapping Machine, O.D.Lapping Machine with VFD, Through Feed Super Finishing Machine and Horizontal-Vertical Honing Tools. Applying superior technological approaches, we offer our range of products in compliance to the international standards. The company was founded in the year 1989 by our visionary & intellectual founder Mr. R.K. Surve. Under his tutelage, we have earned a reputation for ourselves as a prominent business enterprise offering unmatched quality in product's attribute, customer oriented services and cost-effectiveness. This assists us to gain a immense patronage all over the globe. Our valuable experience of two decades and excellent manufacturing unit assist us in fulfilling customized requirements of our clients for honing and lapping machines. With excellent understanding of entire technical know-how, we can customize our range of machines as per the specific needs and requirements of our clients. 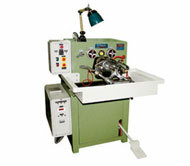 We use the different packaging procedures as per the type, amount and quality of the machines. In addition, we also facilitate transportation to deliver product consignments timely. For this, we have associations with various C&F agents. This facilitates timely and effective delivery of these machines anywhere in the world. • Turbosan Hydraulic Machinery Co.Ltd, Turkey.